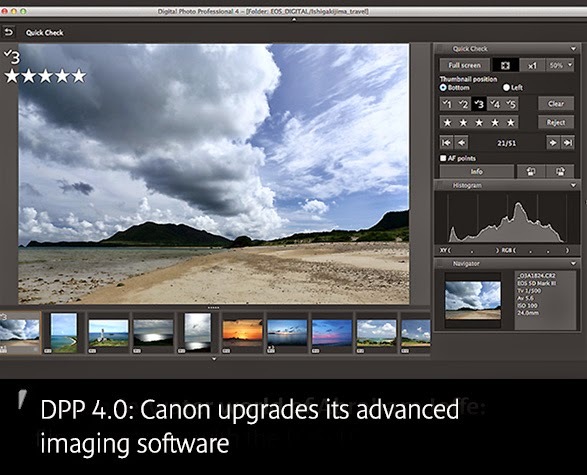 Canon has launched Digital Photo Professional (DPP) 4.0, the first sweeping overhaul of Canon’s RAW processing software since its launch. The latest version of DPP - available for download at the end of June - has been updated with a raft of key changes to satisfy the most demanding of digital photographers. For those who can't wait, you can download the software now from Canon's Australia website. Canon software engineers – having the unique advantage of being able to directly harness the power of the Canon sensors, DIGIC processors and lenses – have made the all-new Digital Photo Professional 4.0 a much faster, more dynamic, linear and feature-packed image editing software solution, thanks to the ability to fully utilise 64-bit architecture. The latest version of DPP has been designed and developed from the ground up, tailored to the workflows of professional and high-end amateurs to help them realise the key EOS System concepts of speed, ease of use and high image quality. New, improved Canon algorithms have been optimised to make the most of the wealth of information delivered by the camera sensors, while productivity has been increased thanks to improved speed of RAW image display and developing that makes real-time image adjustment a reality. The all-new Digital Photo Professional has been re-engineered to give the most discerning photographers a far more comprehensive set of tools and functionalities to get the most from their images. The all-new DPP 4.0 features faster real-time processing and offers a secondary image window, which can be used as a magnifier for detailed inspection of chosen areas of an image. At launch, DPP 4.0 is compatible with Canon’s current range of full-frame DSLRs, including the EOS-1D X, EOS-1D C, EOS 5D Mark III and EOS 6D. For other models, an update of DPP 3.14 will be released. Please note: DPP 4.0 will be compatible only with 64-bit OS, such as Windows 7, 8 and 8.1, plus Mac OS X 10.8 and 10.9.